Apple announced this week that OS X Lion will ship in July. Mac OS X Lion does not include the "Rosetta" technology that emulates the PowerPC (PPC) processor. Without Rosetta, any Mac OS X applications which only have PPC code will not run! If you are unsure which applications are PPC only, either find the application on your hard disk and "Get Info" (command-I) or run the application and then open the Activity Monitor to see the application type. Many common Color Management tools and utilities are PPC only and will not be available to users running OS X Lion. This includes: ProfileMaker (including ColorPicker, Editor, MeasureTool), Monaco Profiler (including GamutWorks), MonacoQCcolor, Eye-One Share, Eye-One Match, ColorShop, ColorLab, Pulse ColorElite, MonacoOptix and numerous others. X-Rite, CHROMiX and other companies offer tools that have been updated to run on Lion and will perform many similar tasks as the older PPC software you may be accustomed to using. CHROMiX is creating the Mac OS X Lion Color Management Migration Tool which is a reference table to help determine if there are alternatives for your tools and needs. It will be available this week and we'll update it regularly as needed. Pat Herold reviews the NEW basICColor DISCUS a high lab-grade colorimeter for measuring LCD monitors. We believe that the DISCUS will set the high bar for reference devices. See Pat's article below. Curve2 was fully integrated into the new ONYX X10.1 RIP software! CHROMiX, HutchColor and ONYX Graphics coordinated together to make this happen. See Color Industry News below. CHROMiX is now officially the US Reseller for basICColor products. Maxwell has rolled out across the country and the world. As of newsletter "press time," Maxwell contains over thirty six million (36,000,000) measurements from the UK to China and is growing every day. If you have a success story you'd like to tell, please contact us at Maxwell Success Stories and we'll get it told! June 15th, 2011, 6:30 PM - at the Lucky Labrador Brew Pub, 915 SE Hawthorne in Portland, OR. Pacific Northwest Color Management Users Group - Portland Chapter - Invites you to 'CMUG Forum Live'. We will be chatting about all things color and having a Q&A driven by attendees. CMUG's new focus is a changed format oriented towards discussions of real problems people face (regarding color management) and real world solutions for these problems. Color experts and CMUG Advisors will be present. No cost (except for your own beverages). Food provided. Plenty of free parking. Come join us! However, OS X Lion is a significant departure and will break any application not built for the Intel processor (which is a lot of apps). CHROMiX announced this week the Mac OS X Lion Color Management Migration Tool (announced in this newsletter) to aid color people with the transition. Terrie Barbera: pointed out a fascinating PDF piece from Eizo on the subject of color wheels. Just last July, I wrote an article explaining the current state of affairs in the area of monitor calibration, specifically explaining the different hardware devices out there that are used to calibrate and profile monitors. (ColorWiki: Profiling Devices for Monitors) At that time there was a noticeable gap between the need to profile certain high-end, wide-gamut monitors and finding a device that will profile them to their maximum potential. To over-simplify things a bit, we usually recommend people use a spectrophotometer to accurately measure their extremely saturated colors. But the common spectrophotometers don't measure blacks very well and some shadow detail is lost as a result. Colorimeters on the other hand, can measure blacks well, but might not be so good at measuring these saturated colors. At that time all I could do was to tell you the way things were and leave it up to you to decide between accurate color or good shadow detail. I'm going to let you in on a little known, color management dark secret. It is quietly acknowledged among those in the field that the typical monitor calibrating device is not designed for or is capable of giving you 100% accurate measurements. These devices are designed to give you good, repeatable results - which allow you to bring your display back to a calibrated state - that is reasonably close to what you're aiming for. If you stop to think about it, there's really no way for a $200 instrument to give laboratory-precision results. (For that kind of accuracy, people normally pay upwards of $16 - $20,0000 for a research-quality spectroradiometer like a Photo Research device, for example this) But our little pucks hanging on the front of our monitors do a fine job for us just the same. They are a lot more accurate than our eyes, they bring our displays around pretty close to the colors we're aiming for, and they repeatedly give us these results month after month, so that we can count on the color of our monitor not changing. This allows the photographer and graphic artist to do their viewing with a degree of confidence and get their color managed workflow moving smoothly with no surprises. For some reading this, that last paragraph was interesting but not all that alarming. For others, this claim is probably rather jarring. Not 100% accurate!? That's intolerable! In the line of work I do, I've GOT to have accurate color! It is for this latter group that the DISCUS was made. All this accuracy does not help you much if your readings fluctuate from measurement to measurement. Most of the common monitor-calibrating devices have the potential to vary quite a bit from one reading to the next - especially when there is a change in physical temperature of the device or the ambient heat. You can see this when you perform a "validation" procedure on your profile at the end of your profiling procedure. Many software programs offer this option at the end of the profiling workflow, so you can check out how your profile is performing immediately after you have created it. Well, immediately after you have created it, your profile should be perfect, right?! Instead, you'll find that there are always some delta E variations, and this is a good indicator of the range of how variable your particular instrument is. It is not unusual to see single color delta E variations of 1.0 or more within the same instrument. The problem with this is that it is possible that you could see changes in color on your display after calibrating that are due to the inconsistency of the measurement device rather than the display itself. Now, I don't want to over-state this and bring everybody into a panic. For the most part, your i1Display, or Spyder, or ColorMunki, or i1Pro will probably work fine, and give you very accurate profiles from month to month. But you can see where, for those who really depend on quality at this caliber, there has been a need for an instrument with better repeatability. At the same time we went to check consistency, we wanted to see how well this much-vaunted "temperature compensation" would work. Some of the variability of different instruments has been attributed to how warm the instrument is when it is being used, or how it warms up AS it is being used - and the DISCUS is said to compensate for changes in the ambient temperature around the instrument. To see if this thing worked, I took a wide gamut monitor, a Discus, and an i1Pro into the back hallway of the CHROMiX headquarters on a chilly day in April. We've been getting far too many of those this Spring, so it was nice to actually have a good use for it. Once the display and the measurement devices acclimatized for over an hour, I made multiple measurements and profiles using the basICColor software since that was the only program that could drive both instruments. Afterwards, I carefully replicated the same profiling procedures back in our normal, 72-degree office environment. I also repeated these tests using a more typical "sRGB" gamut LCD display. From the profiles that were created, I extracted the actual measurements that were used to make the profile, so we could compare the actual measured values of these identical color sets. 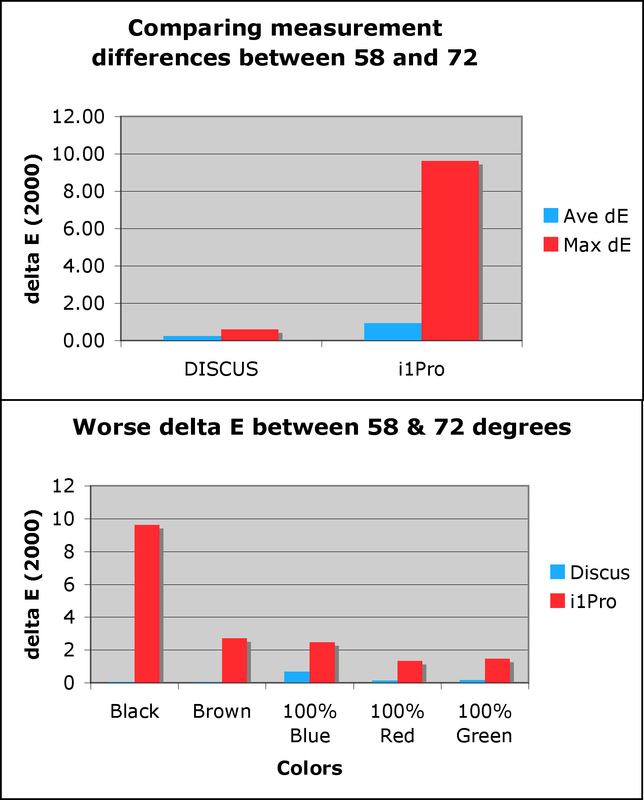 The difference between the Discus and an i1Pro were dramatic. The average dE was .23 for the Discus, and .92 for the i1Pro. However, the Max dE (the difference for the worst patch) was .60 for the Discus and 9.62 for the i1Pro! The patch responsible for this huge difference with the i1Pro was the black patch, which measured at a lighter luminance with the 72-degree, "warmer" environment. But it wasn't just the black: Saturated primary colors had high differences well over 1 and 2 dE. (See Diagram) By contrast, the Discus seemed to just cruise along regardless of temperature changes. Imagine measuring 2 weeks apart, 14-degree change in temperature, a slightly different placement on the screen, and the largest difference I measured out of all the Discus tests was a .31 Ave dE and a .86 Max dE. Numbers that low can be attributed to changes in the display over that time. Now you may not have occasion to calibrate your monitor next to a hockey rink, but this test does demonstrate how big a change is possible, and how precise a good colorimeter can be. It makes you wonder how much the environment affects your profiles. Do you profile first thing in the morning after the furnace/AC comes on? Was your colorimeter sitting next to the heat register before you picked it up to profile your monitor? Did you handle your i1Pro for several minutes scanning a printer target, before calibrating the monitor? Are your employees doing any of these things? The nice thing about the DISCUS is that none of these everyday temperature changes will have a significant affect on your measurements. I don't know which contributes more to the durability of this product: The heavy metal construction of the casing - or the knowledge that this colorimeter costs over $1000? Somehow the price tag kept me from experimenting with any durability tests. It certainly looks, feels and handles like an armor-plated tank, and according to the company literature, they made it to be long-lasting. While the on-screen measurements are very accurate, Ethan Hansen at Dry Creek Photo reports that the ambient light measurement of the DISCUS is consistently about 600 Kelvin too low. So if you were to use the DISCUS to give you a reading of the color of the ambient light in your room, it will report that it is warmer in color than it really is. Perhaps this will be dealt with in further upgrades to the software. While this article mainly concerns the DISCUS device, I'll say a few words about the basICColor Display software since (at the moment) it is the only software that works with the DISCUS. There are reports that Eizo is looking into supporting it in the near future in their ColorNavigator profiling software. There are a few glitches in basICColor Display that indicate they have not got all their wires hooked up. The basICColor software does not seem to be able to connect to an i1Display2 device. Other users have found that some NEC displays will only calibrate to a D50 white point when calibrating using DDC communication. I find it surprising that the software is limited to its pallet of 45 colors, and does not provide a means of using a larger set of patches. None of these are really deal-breakers if you want to look more into the DISCUS. The current version (v. 4.2.4) is the first to support the DISCUS, and they are looking to come out with an entirely new version 5 soon. The DISCUS fits the bill for everything a high end user needs in a display calibration device. I can almost say that I have not found anything better. 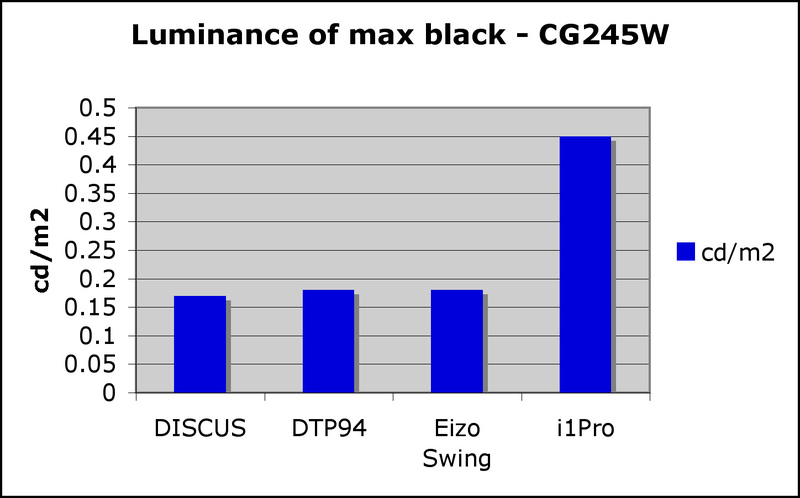 The only instrument that rivals the DISCUS for these superior results in accuracy and shadow detail is the built-in swing sensor that comes with the Eizo CG245W and CG275W. These sensors also do a great job calibrating their own wide gamut displays and still provide excellent black readings for fine shadow detail. For any other displays, the DISCUS is the only way I know of to get this kind of precision in an instrument at a fraction of the cost of a spectroradiometer. Despite its hefty price tag, I expect that the DISCUS is destined to be a common tool in the arsenal of color management professionals in the years to come. Entire Contents of CHROMiX ColorNews (c)2011 CHROMiX, Inc. CHROMiX, Maxwell, ColorThink, ColorNews, ColorSmarts, ColorGear, ColorForums, DisplayWatch and ProfileCentral.com are trademarks of CHROMiX Inc. All other trademarks are property of their respective owners. CHROMiX ColorNews is intended as an informative update to CHROMiX customers and business associates. We are not responsible for errors or omissions. You may not copy or reuse a ny content from this newsletter without written permission from CHROMiX, Inc.